In my last post I was discussing the book Space-Perception and the Philosophy of Science by Patrick A. Heelan. 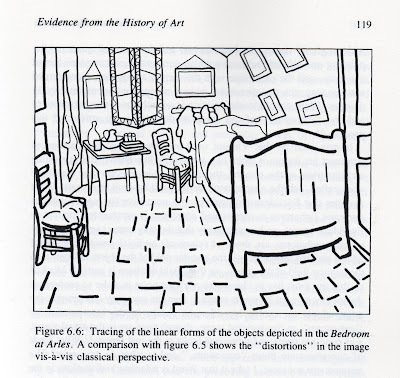 This is a follow-on post focusing on one aspect of the book where he mentions the possibility that artists from the past may have tried to incorporate hyperbolic perspective into their artwork. 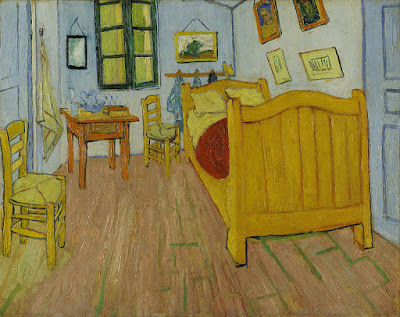 The most striking example in the book concerns the work of Vincent van Gogh, in particular his painting Bedroom in Arles. Heelan points out that the painting, instead of following the conventions of standard linear perspective that artists would normally use, actually tries to capture or convey the curved hyperbolic space within which we actually see the world. Whether Van Gogh was consciously trying to achieve this effect or simply following his own artistic or aesthetic instincts is an issue of contention. 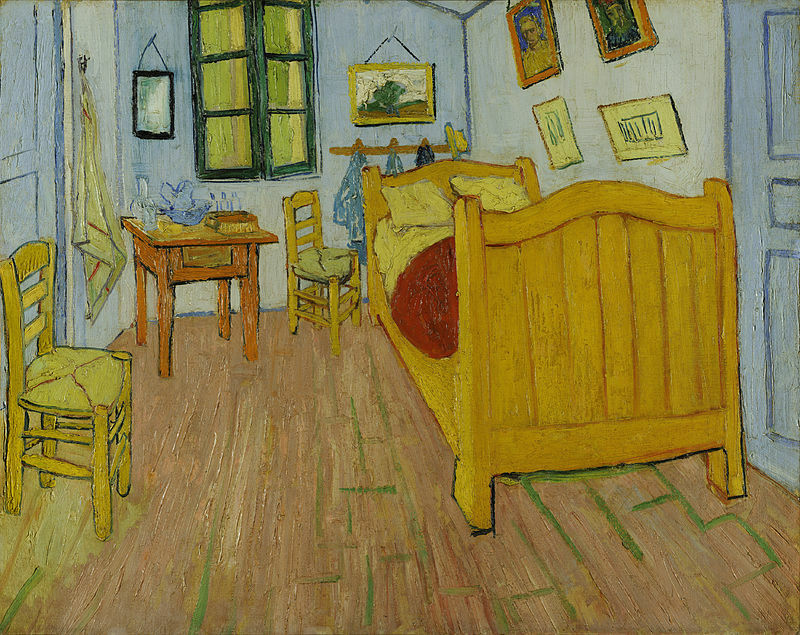 However, intentional or not, Heelan provides images that illustrate how this painting differs from how such a room would normally be painted using standard perspective techniques. 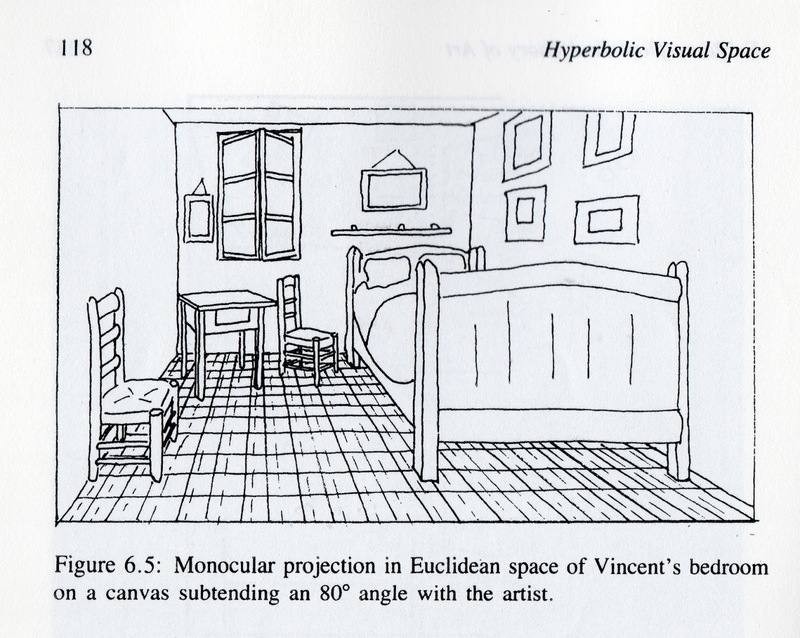 The first image (Figure 6.5) shows how the bedroom would be depicted using standard linear perspective. Note the straight regimented box-like structure of the room. 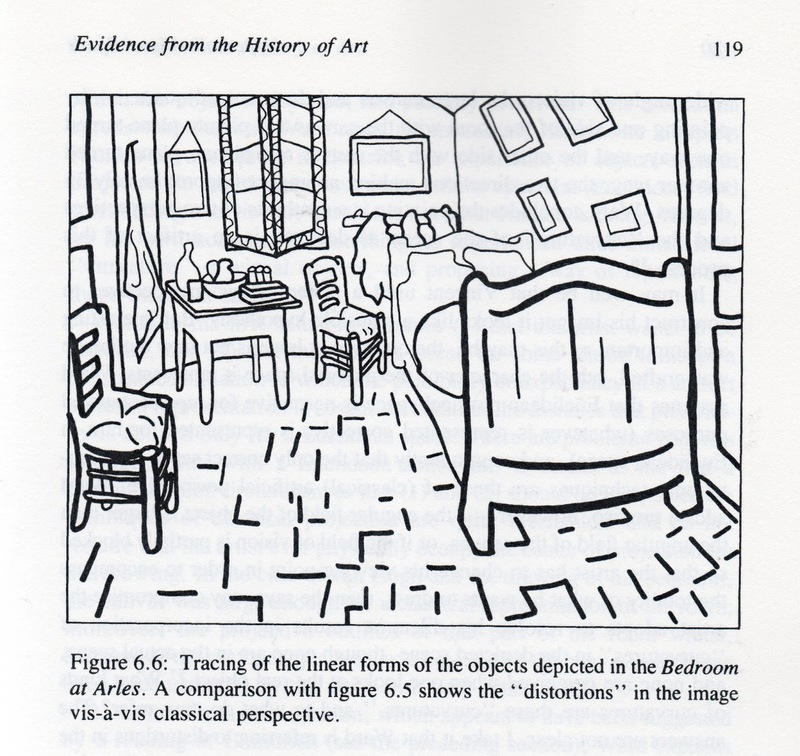 However, in this second image (Figure 6.6) we see Heelan has traced over the Van Gogh painting, showing how radically it differs from the first. Note for example how the bottom edge of the bed at the front of the painting appears to curve. Also note the angle of the walls, and how they appear to form a single curving wall, as oppose to what should be three distinct ones. Likewise note how the seats of the chairs appear to tilt towards the viewer. If you study the image you'll notice many other "distortions" like this. It's a very fascinating thing to take note of, and something I would never have thought to look for in a painting had it not been for this book. 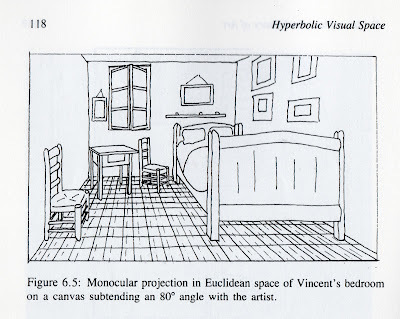 I guess the real question then is; does the Van Gogh version look more realistic than the one following the standard conventions of perspective? Does it more accurately depict what we actually see with our eyes when we stand in the real world and view objects? It's a difficult question to answer. Of course, the Van Gogh painting wasn't intended as a photo-realistic image. The intention was no doubt more an artistic rendering, an interpretation of reality, so that needs to be taken into account too. However, even photographs can't capture the reality of what we actually see when we're experiencing full 3D reality, and this goes to the heart of the issue, and is why Heelan in his book claims that hyperbolic perspective offers a much better approximation of what we actually see with our eyes than Euclidean renderings can. For anyone who'd like further information on this topic I recommend the following web page. It's a blog post by an artist called Rob Adams, and it explains the issue of spherical perspective better than anything else I've come across online. It's very easy to understand and explains the problems that can arise when attempting to render what we see in the real world in a 2-dimensional image. He also explains the famous "fish-eye" lens effect in a way that's very concise and easy to understand. I really can't recommend the article more highly.